George Graham Reviews Jason Reeves' "The Magnificent Adventures of Heartache"
Regular listeners to this series know that I put a high value on musical creativity, eclecticism and/or lyrical content. Being an iconoclast with a high level of musicianship is a plus in my book, even though it may mean commercial obscurity. But as a long-time Beatles fan, I also have a soft spot -- in fact I'm a bit of a sucker -- for upbeat, melodic pop that's well-done and has the kind of musical interest that the Beatles brought to all their recordings. So this week, we have one of those infectious vaguely-Beatles influenced pop albums that gives one a degree of encouragement about the younger generation. It's by Jason Reeves, and it's his first full-length release called The Magnificent Adventures of Heartache (and Other Frightening Tales). I say I'm encouraged about the state of music from young musicians since Reeves is about 23 years old, and hails from Iowa City. He writes songs that are the epitome of bright pop, with appealing high airy tenor vocals, hummable melodies and lyrics, which though almost all about love in one form or another, are fairly clever and do manage to say some familiar things in a fresh way. According to his publicity bio, after enrolling in college at age 21, Reeves dropped out after two weeks to pursue his music, playing his guitar and writing songs, hoping for the proverbial big break. He made a trip to New York to play as part of a music festival there, and said is quoted as saying that there were about three people in the audience and two of them had stopped in to ask for directions. But one of them did have some business connections to a music website, and eventually that led to hooking up with a talent scout company and one Ken Krongard, who in a previous A&R job signed Avril Lavigne. Krongard was impressed with Reeves' work and is listed as "executive producer" of Reeves' independent release, meaning probably investing in the recording. Reeves had previously made a trip to Los Angeles to record an EP and worked with producer Mikal Blue, who was business partners with Ken Caillat, the producer of Fleetwood Mac's Rumours. Caillat's 20 year old daughter Cobie and Reeves became fast friends and started working together while he was on the west coast, co-writing some songs. She was recently signed to a major label, and Reeves wrote some of the tunes on her CD. After the release of his EP Hearts Are Magnets Reeves made more trips to Los Angeles to work with Blue on a full-length release, and the upshot is The Magnificent Adventures of Heartache, which so far is a very independent release. In fact, on his "myspace" page Reeves offers to autograph each CD if you buy the premium version. But all the music business serendipity aside, Reeves' recording is a thoroughly infectious one, with great tunes that inhabit a space between the Beatles, the Beach Boys, Donovan, and groups like the Buckinghams from the 1960s and the Cardigans from the 1990s. He has a great voice that has the kind of ease with high notes that youth brings, and a musical backing that most often centers on acoustic guitar. The production quality is first rate, not sounding at all like a typically sonically-challenged independent release, and at the same time, not often getting into pop cliches, though there are inevitably a few moments that could be called mainstream pop. But overall, it's a thoroughly pleasing CD that it as likely to appeal to Baby Boomer Beatle fans as it is to those of Reeves' age. This CD's modest packaging has little information on personnel, but there is a small, tasteful band with a prominent keyboard player. 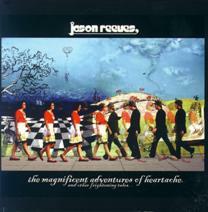 Jason Reeves' new CD The Magnificent Adventures of Heartache is a worthwhile and very likable album of intelligent melodic pop, generally tastefully done with Reeves' songwriting a particular strength, and his vocals quite appealing. Sometimes it seems that the best artists making this kind of music are the young. The Beatles, after all, were in their early 20s during their peak period in the mid 1960s, and there have also been recent examples of young artists doing this kind of music, including Brian Scary, whose CD we reviewed some months ago. Perhaps it's the combination of youthful ability to hit those high notes, and an outlook that has not yet become jaded. In any case Jason Reeves' new release has all the right ingredients. Sonically, we'll give the CD about a B-plus. The sound is bright, but heavily compressed much of the time -- something that is not quite so bad on this kind of music. But occasionally there is the annoying effect on Reeves' voice that sounds like an electronic pitch corrector, so common today on corporate pop music -- something that Reeves does not seem to need, judging from the sound of live tracks. Interestingly, on the web where most of the activity for Jason Reeves is taking place, he won a the #1 position for top unsigned folk artist on myspace.com. Though there are acoustic guitars, Reeves' CD The Magnificent Adventures of Heartache is definitely more in the melodic pop genre, as I see it. In whatever category, it's an impressive and generous recording from a talented young Iowan from whom I'm hoping we'll be hearing more in the future. (c) Copyright 2004 George D. Graham. All rights reseved.